, an ancient historian, of the eleventh century, was an Anglo-Saxon, of a good family in Lincolnshire. When a young man, he was delivered by the people of Lindsay, as one of their hostages, to William the Conqueror, and confined in the castle of Lincoln. From thence he made his escape to Norway, and resided several years in the court of king Olave, by whom he was much caressed and enriched. 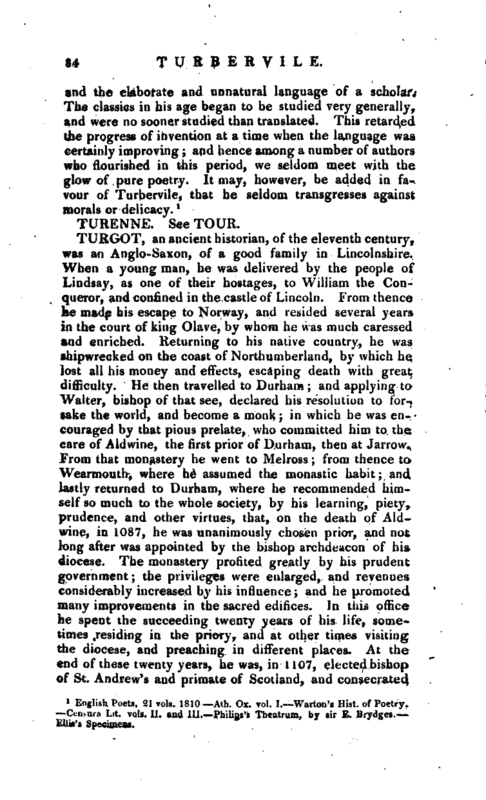 Returning to his native country, he was shipwrecked on the coast of Northumberland, by which he lost all his money and effects, escaping death with great difficulty. He then travelled to Durham; and applying to Walter, bishop of that see, declared his resolution to forsake the world, and become a monk; in which he was encouraged by that pious prelate, who committed him to the care of Aldwine, the first prior of Durham, then at Jarrow. From that monastery he went to Melross; from thence to Wearmouth, where he assumed the monastic habit; and lastly returned to Durham, where he recommended himself so much to the whole society, by his learning, piety, prudence, and other virtues, that, on the death of Aidwine, in 1087, he was unanimously chosen prior, and not long after was appointed by the bishop archdeacon of his diocese. The monastery profited greatly by his prudent government; the privileges were enlarged, and revenues considerably increased by his influence; and he promoted many improvements in the sacred edifices. In this office he spent the succeeding twenty years of his life, sometimes residing in the priory, and at other times visiting the diocese, and preaching in different places. At the end of these twenty years, he was, in 1107, elected bishop of St. Andrew’s and primate of Scotland, and consecrated | by archbishop Thomas, at York, Aug. 1, 1109. Dissentions arising between our archbishop and the king of Scotland, the prelate’s anxiety and distress of mind brought on a decline of health, under which he obtained permission to return to England; and came back to Durham in 1115, where he resided little more than two months before his death. 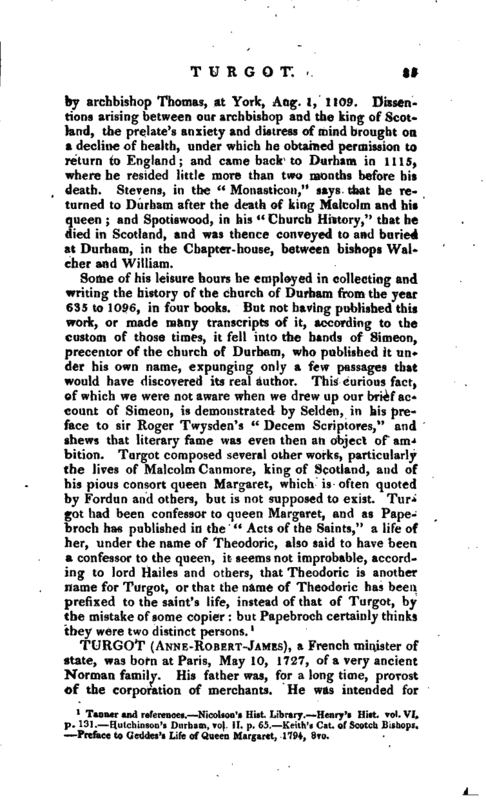 Stevens, in the “Monasticon,” says that he returned to Durham after the death of king Malcolm and his queen; and Spotiswood, in his “Church History,” that he died in Scotland, and was thence conveyed to and buried at Durham, in the Chapter-house, between bishops Walcher and William. Tanner and references. Nicolson’s Hist. Library. Henry’s Hist. vol. VI. p. 131. Hutchinson’s Durham, vol. II. p. 65. Keith’s Cat. of Scotch Bishops. Preface to Geddes’s Life of Queen Margaret, 1794, 8vo.